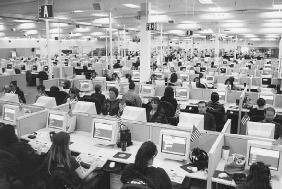 Census workers in a Phoenix, Arizona, data capture center. For the 2000 Census, the bureau planned to hire 850,000 temporary employees to assist its 6,000 permanent employees. The U.S. Constitution requires that a census of the entire population, citizens and noncitizens alike, be made every ten years (Article I, Section 2, Clause 3). The Fourteenth Amendment to the Constitution directs that the census will be used to determine the number of members of the U.S. House of Representatives from each state. The census is conducted by the U.S. census bureau, an agency established in 1899 within the U.S. Commerce Department. The data gathered by the U.S. Census Bureau are used by the states to draw boundaries for congressional and state legislative districts, and by local governments to establish districts for other representative bodies such as county legislatures, city councils, and boards of supervisors.Census data are also used to allocate federal and state funding and services. By the mid-1990s, more than $50 billion in federal aid for education, housing, and health programs to states and cities was distributed annually based on census numbers. In addition, census information is used in academic research and is sought by product manufacturers and marketers who want to know the demographics of potential consumers. By 1980, the Census Bureau conceded that the decennial censuses were undercounting portions of the population, usually low-income and minority groups in the inner cities. In follow-up surveys after the 1980 census the bureau determined that it had missed some 3.2 million persons, or 1.4 percent of the population. For example, a 1986 post-census survey of East Los Angeles estimated that the 1980 census missed about ten percent of the Latino community, seven percent of the Asian community, and nine percent of the black community. Census officials determined that overall, nearly six percent of the black and Hispanic populations were uncounted and less than one percent of the white population. The plaintiffs in Wisconsin v. City of New York 517 U.S. 1, 116 S. Ct. 1091, 134 L. Ed. 2d 167 (1996), attacked the secretary's decision, contending that it was tainted by partisan political influence and violated the Constitution, the Administrative Procedure Act of 1946, and the 1989 stipulation agreed to by both parties in the case. After a 13-day bench (non-jury) trial, the district court concluded that it could not overturn the secretary's decision (City of New York, 822 F. Supp. 906 [E.D.N.Y. 1993]). On appeal, the court of appeals concluded that, given the admittedly greater accuracy of the adjusted count, the secretary's decision was not entitled to be upheld without a showing by the secretary that the refusal to adjust the census was essential to the achievement of a legitimate government objective (City of New York, 34 F.3d 1114 [2d Cir. 1994]). On appeal, the Supreme Court reversed the decision of the Second Circuit, holding that the secretary's decision not to adjust the census was within the government's discretion (___ U.S. ___, 134 L. Ed. 2d 167, 116 S. Ct. 1091 ). From these test projects the Census Bureau announced that it would use statistical sampling to take into account historically undercounted populations. These populations included minorities, renters, children, poor persons, and illegal Aliens. Although the American Statistical Association supported this approach as a valid methodology, the announcement set off a political firestorm. Congressional Republicans, worried that sampling would lead to congressional Apportionment that favored the Democratic Party, filed a lawsuit challenging the constitutionality of the proposed practice.The Supreme Court, in Commerce Dept. v. U.S. House of Representatives, 525 U.S. 316, 119 S. Ct. 765, 142 L. Ed. 2d 797 (1999), ruled, in a 5–4 decision, against the use of statistical sampling, holding that the 1976 amendments to the Census Act (1954) prohibit the use of statistical sampling for purposes of population head counts. Justice Sandra Day O'Connor, writing for the majority, stated that there had been over two hundred years of history "during which federal census statutes have uniformly prohibited using statistical sampling for congressional apportionment." 2. For the purpose of keeping the representation of the several states in congress equal, the constitution provides, that "representatives and direct taxes shall be apportioned among the several states, which may be included in this Union, according to their respective numbers; which shall be determined by adding to the whole number of free persons, including those bound to service for a term of years, and excluding Indians not taxed, three- fifths of all other persons. The actual enumeration shall be made within three years after the first meeting of the congress of the United States, and within every subsequent term of ten years, in such a manner as they shall by law direct." Art. 1, s. 2; vide 1 Story, L. U. S., 73, 722, 751; 2 Id. 1134, 1139, 1169, 1194; 3 Id. 1776; 4 Sharsw. continuation, 2179.